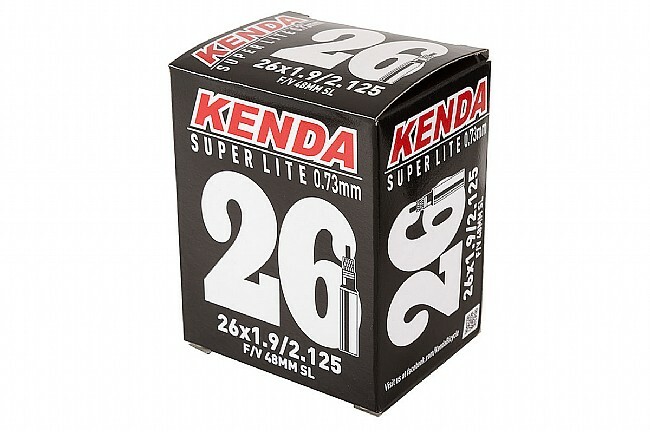 Kenda Superlight tubes feature a high quality butyl construction with 0.14mm less thickness than a standard weight tube for a lower rotational weight. Available in 26" (559 ISO) sizes in various widths. Available with Presta or Schrader valves. Tubes, tubes and more tubes by Kenda that rock! Cheap and easy to install. Last a couple seasons so far! Bought 4 of these tubes at one time. Put first one on, rode 5 miles, BAM ! first one blew. Second one put on in my living room. Left bike in living room. Wife and I were watching TV. Resumed riding two years ago after lengthy layoff. Purchased several Kenda road tubes and several mountain bike tubes. Experience to date is that I never know when walking into garage morning after a ride if my tires will be full or flat. Upon repairing, I have found minute pinhole leaks along the tube seam. This points to poor quality raw materials, poor production control at manufacturing plant or inadequate product manufacturing specs. When I run out of tubes, I will switch to another brand. Tired of changing flats. A couple of these just randomly blew themselves up, both times right along a seam. Once just sitting in the garage and once right after a ride. Both were at about 60psi in tires rated 85 psi, so they weren't over-inflated. And they were on different bikes with different wheels and tires. I still have a couple others in tires with no problems, but I don't trust tubes where 2 out of 4 randomly kill themselves. I like the idea of light tubes, but I won't buy these again. It's s tube. What can I say. I bought two of these tube and one of them didn't last 5 minutes. The other one is good. I ride flat, well groomed, crushed limestone trails. Excellent . no problems . using for a month and had to refill them once due to natural air loss. Good tube, great price tag! Bought to replace the stock tires & tubes on my antique Giant. Seems like a great tube, installed easy enough & holds air well. Thick enough I think to ward off flats. We'll see.! I am biking on roads regularly and they do all I have needed them to.